As seen with previous OS versions on the PlayBook, users have been very quick to adopt OS 2.1 when it was released last month. October saw 73.3% of PlayBook users running the new OS. Most of those running early versions were from the first week of the month, when OS 2.1 was not yet released. This data was collected by AppWorld at the time of download, for the popular PlayBook strategy game Pixelated. 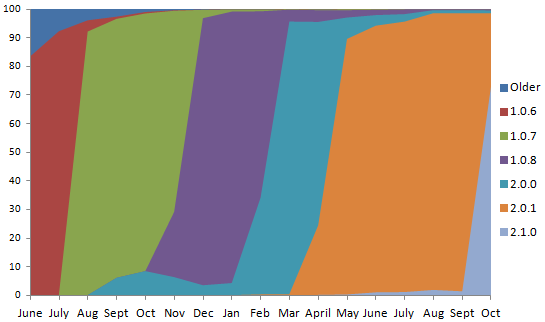 Data shown on the chart is from the beginning of June 2011 through the end of October 2012.